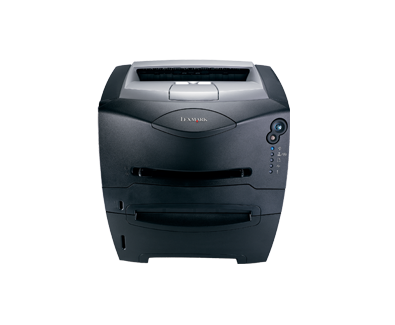 Besides its compact size, small price and sleek, robust design, the Lexmark E240 desktop laser printer offers incredibly fast print speeds for its price range. With the network model, it's easy to spread the advantages to multiple users. Beside the cost benefits, the E240n comes with double the standard memory, more pre-loaded fonts, and even higher resolution at up to 1200dpi. Add the optional second tray to that and you're well equipped for workgroup efficiency! The E240 is among the fastest desktop printers in its price range. Boasting print speeds up to 26 ppm and a time to first page less than 8 seconds, you get your documents in your hands in no time at all. And for a desktop printer, it offers a surprisingly robust duty cycle to suit your busy workloads. Combining standard PCL6 printing with crisp laser-quality output, the E240 lets you produce professional-looking documents with a wide range of fonts and languages. What's more, thanks to auto-compensating paper-picking technology, you enjoy a smooth, reliable feed every time.